ARLINGTON, Va. (May 03, 2007) -- While it's too early to be Halloween, some of the exhibits on display at the "Dome" in Arlington, Va., might look right at home in a haunted house. There, amidst spotlights and educational material, are entire human bodies posed, without clothes, and without their skin. But these are not props. They are real human bodies that have been donated for educational use, and they are part of "Bodies ... the Exhibition," a traveling exhibit that showcases, in rare form, perhaps the greatest machine on Earth -- the human body. A real human body, split vertically, to display the organs, muscles, brain and spine. The body is part of an exhibit on display now in Rosslyn, Va. called "Bodies ... the Exhibition." The exhibit, both fascinating and educational, features real human bodies, in various poses, to illustrate the various systems in the human body. 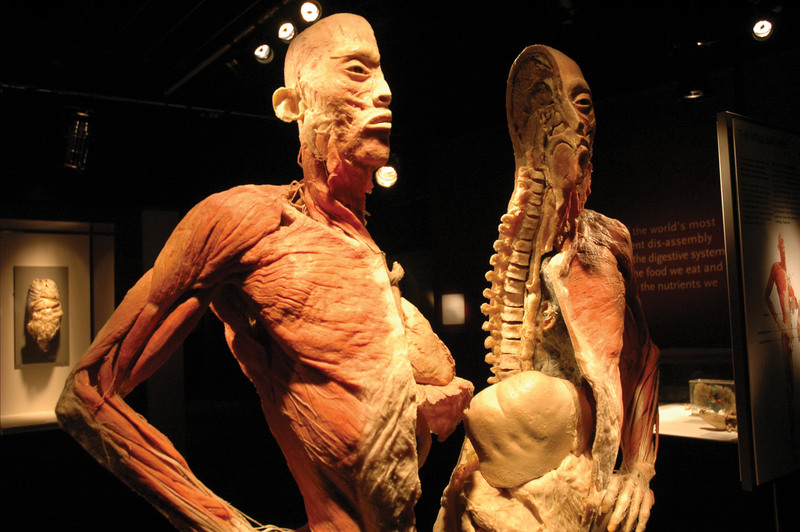 Bodies ... the Exhibition, features real human bodies, and in some cases parts of the body, that have been preserved using a special polymerization process which removes all fluids and replaces them with a polymer. The bodies then take on a rubbery kind of feel, and are essentially preserved indefinitely. The exhibit is divided up into sections based on different systems in the body: nervous, respiratory, circulatory and muscular, for instance. Within each section, specimens are on display that highlight relevant portions of the body. Also in each section are ample amounts of reading material, and even a dedicated staff member that can answer questions about the exhibit and about the various systems of the body. In the section featuring the circulatory system, for instance, an entire human body is displayed inside a glass case that shows only the blood vessels. That specimen was prepared using "corrosion casting." The body was prepared by filling the circulatory system with a colored silicone material, while the rest of the tissue was removed with a special enzyme -- a process that take months to happen. The effect is amazing -- creating what appears to be a 3-D sculpture of the human body, made entirely of red lace. It is impossible to look at the specimen and not recognize the shape of the lungs, or the heart, outlined only by the blood vessels that once served them. Or to realize the incredible amount of blood the brain must require. Despite what might seem a bit creepy upon first consideration, the exhibit is both educational and fascinating, even for young children, said Cheryl Mure, the director of education for the exhibit. "I think this is an amazing exhibition for children," she said. "Children as young as four years old come into Bodies ... the Exhibition, and they are amazed, and their eyes open wide when they look at these bodies. The first thing they say is 'oh look, there's my heart, there's my leg.'" The exhibit is now drawing in school groups, senior groups, and tourists alike. Even those who home school have come in to view the exhibit, citing the education opportunity as something too good to miss. L.A. Brickner, of Ellicott City, Md., home schools her kids, twin 13-year-old boys, and an older son, 15. She said what was there was something so far beyond what was available in books, that she didn't want to miss it. "I thought this is an amazing lesson in the human body," she said. "It's much more than what you could see from animation or books. It's also not going to be here forever, so it's important to get down here." Brickner said she expected that she wouldn't be too affected by what Bodies ... has to offer, but she felt differently when she arrived at the gallery. "I wasn't expecting I'd have any kind of reaction to that it is actually human beings. I thought I could be clinical about it, and picture it as art," she said. "But I had immediately a strong sense that these are people, it hit me right away, and it makes it much more real. You see these as people, not art." Brickner's son, Kai Filipczak, 15, was impressed with the nervous system display. "I thought the spinal cord and vertebrae are well done and interesting," he said. "It's fascinating. You never think about the stuff that actually goes on in your body, it's all under your awareness." Mure said the exhibit is carefully crafted to ensure viewers understand that what is on display are real human bodies, so that they can act appropriately. "This is a museum quality exhibition, so it is very referential, and people are very quiet as they are viewing it," she said. "It's pretty with the light and the colors, and it makes people feel more comfortable here. It also sets an atmosphere of respect for what they are looking at." Mure said she hopes viewers of Bodies ... the Exhibition come away with a greater appreciation of the human body and its complexity, and also a greater respect and desire to care for their own bodies. "We hope that an outcome of visiting Bodies ... the Exhibition is that you have new respect for your own body and a new commitment for taking care of your body," she said. " We have one body we are born with and that we die with and we need to understand it and take care of it." Bodies ... is what it says it is, real human bodies, on exhibit. The bodies have no clothing, and they remain "anatomically correct." Additionally, there are portions of the exhibit that may raise some eyebrows, including the portion on fetal development. Nevertheless, Mure says that portion of the exhibit remains one of the most talked about and popular, especially with children. "It is the gallery kids remember the most, and it is the gallery that impacts moms the most," she said. "They have a very emotional reactions to it, and it is something they remember. When children go into that gallery, we get uptight as adults -- we gasp. But when they go in, guess what they say? 'Was I that small? Is that what I looked like? I can't believe that that was me.' They see themselves in that gallery, and it is memorable." Bodies ... the Exhibition offers a military discount of 20 percent, on up to four tickets, to buyers with a military ID card. Regular ticket prices for adults are $26.50, children 4-12 are $18, and senior citizens are $21. The exhibit is open 10 a.m. - 7 p.m. Sunday through Wednesday, and 10 a.m. - 10 p.m. Thursday through Saturday. The exhibit is open through October at The Dome in the Rosslyn neighborhood of Arlington, Va., at 1101 Wilson Blvd. It is walking distance from the Rosslyn Metro station, off the Orange Line.